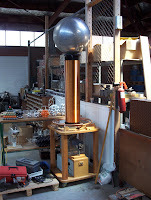 A number of years ago I was approached about a Tesla coil in a deceased estate of a friend of a friend you might say. Naturally this was an opportunity too good to pass up. Upon first inspection I found out the coil had three 12kV neon sign transformers and a rotary spark gap. I duly agreed to take responsibility for the creation and it then sat at work for a few years occasionally being tinkered with. The idea was to build what's called an Off-Line Tesla Coil (OLTC), in that there is no supply transformer: The incoming mains supply is rectified and fed directly into the tank capacitor. OLTCs have some interesting design criteria: With the primary voltage being very low (compared to spark gap coil) The tank capacitor has to be huge in order to supply sufficient energy to the system. The huge tank capacitor in turn means that the primary inductance has to be tiny for the system to have a sensible resonant frequency. 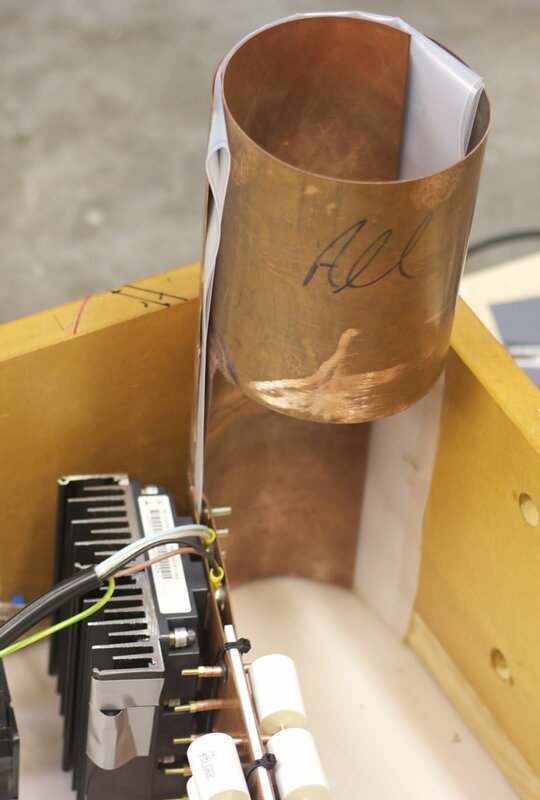 The primary currents involved are pretty massive, as a result the "wiring" has to be pretty heavy duty: In this case the conductors are made from 1.6mm copper sheet, 190mm wide. That is 300 square millimetres of copper! Initial back of a envelope calculations were based on an input power of around 5 to 10kw to make things reasonably interesting. With a reasonably safe maximum switching frequency of around 7-800Hz this meant the tank capacitor needed to store around 10 to 12 Joules. Charging the capacitor to around 1KV, (more on this later) around 20µF was necessary. The tiny primary inductance: Total inductance, which includes the parasitic inductances of the conductors, transistor, ESL of the capacitors etc had to be about 0.1µH or less. This is so that the resonant frequency of the primary matched the secondary. 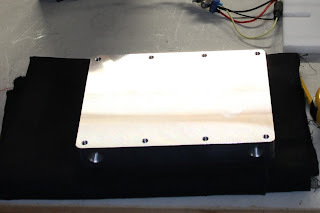 The wider a conductor is the lower its inductance, therefore transmission lines made of nice wide strips of copper have lower parasitic inductances. Sketch of the fabricated primary. The welds were linished flat and all the sharp edges were polished off. 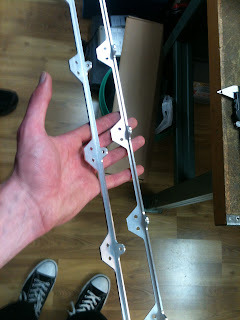 I then put the whole part through a sheet metal roller to give the final shape. the snorkel to the capacitor assembly. sheet to keep the feed line separated. 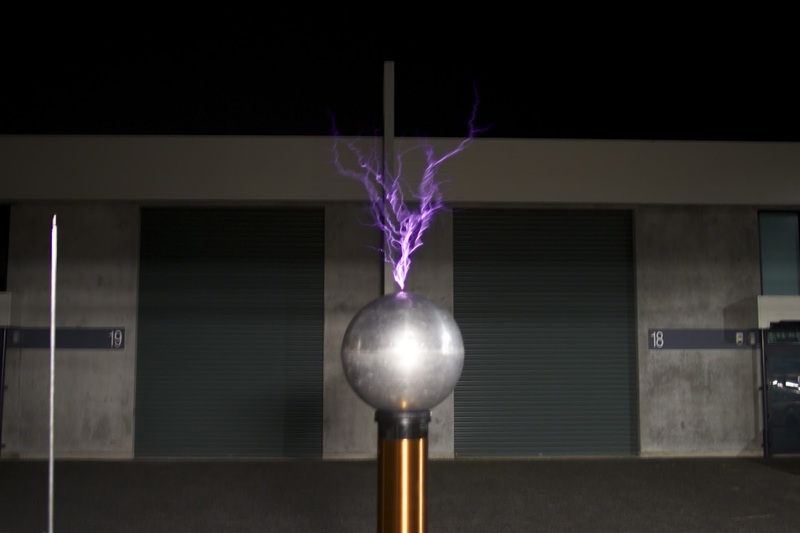 Capacitors in Tesla coils have a pretty hard life, they're charged to high voltages and discharged very quickly... Only to be told to do it many times per second. So naturally they have to be very low loss and rated to huge pulse currents. Capacitor plate to the left. 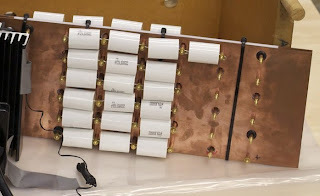 Currently about the best off the shelf solution is to connect multiple smaller capacitors in series-parallel to give the appropriate capacitance, voltage and current rating. In this case depending on tuning there are about 40 capacitors in parallel. The capacitors are mounted to a parallel plate feed line (think double sided PCB) made from two sheets of 1.6mm copper spaced 5mm apart. This is an idea I borrowed from Steve Connor and Greg Leyh. The capacitors connect to the plates using threaded brass studs and copper tubing spacers. Brass studs and copper spacers fitted. One day I would like to build a coil using water cooled capacitors designed for induction heating from a supplier such as Celem: Megawatts anyone? 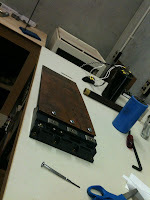 Capacitors fitted to the assembly. Top and bottom mounting bushes. 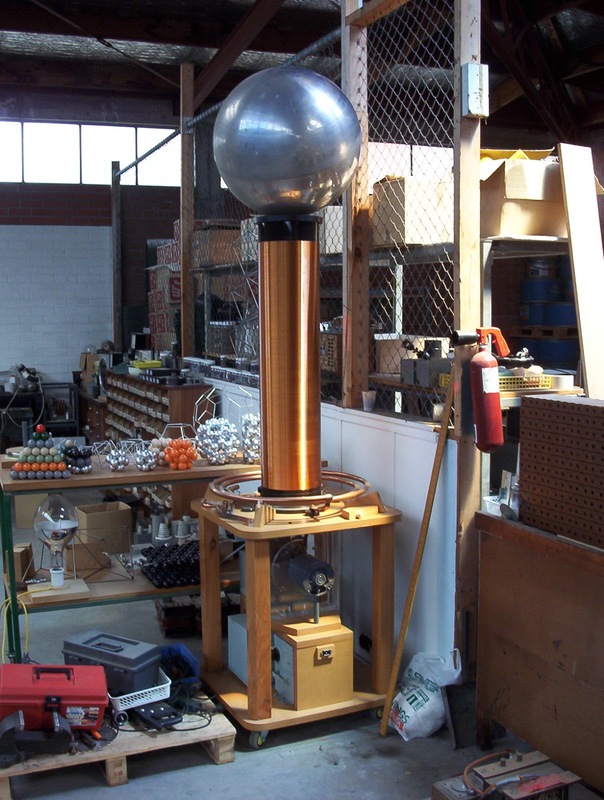 For one tesla coils generate high voltages - Many of the components have to be very good insulators. The secondary former is supported by a combination of 10mm threaded nylon rod, 3d printed bushings and PVC pipe columns. Columns and top bushing fitted. Secondary former sitting on the bushings. 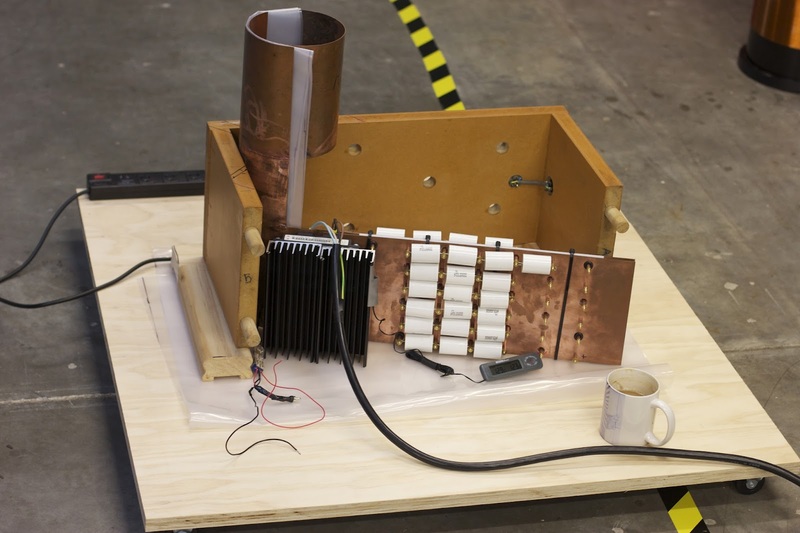 For a lot of the initial running, the power consumption was limited to around 5kw. This changed quite dramatically when I finished building a three phase input supply. A brainwave to do with the implementing a pulse forming in the charging circuit made things even more dramatic. The side effect of much more power is well, much more heat... Until this point we had been using a fan cooled aluminium heatsink, this was ok but things were getting a little hot. The transistor with heat sink. Enter water cooling: I have a friend who's a rather brilliant machinist. We spent an evening drawing up a water cooling block to suit the transistor. An hour or so on the CNC machine later and presto. safety glasses, and two finished cups of coffee... Serious work. For the first test I lashed the system together using a plastic bucket and a spare PC water cooling radiator I had lying around. The first results were more than a little exciting.... The cooling water stayed below 27 degrees celsius during many power runs like the video below... Making Toccata and Fugue even more epic. I've made a better water reservoir than a bucket, Hansen plumbing fittings are great for building crazy stuff like this. Still to be fitted is a new radiator from Koolance: As a final teaser here's the CNC machined mounting brackets for it... Next post will detail the power system. 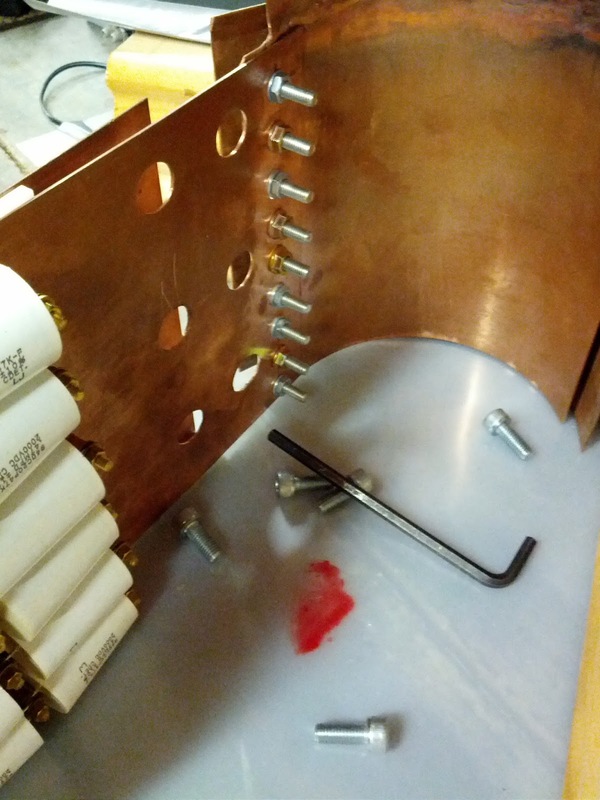 Problem: "Radiator bracket for water cooled Tesla coil"